Pharmaceuticals and specialty chemicals are typically produced in batches by mixing several components in a reactor. When the ingredients are mixed with solvents, the void between the top of the reactor and the liquid level can be filled with highly flammable vapours. When combined with oxygen and a potential source of ignition there can be a risk of explosion. 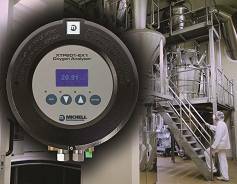 The Michell Instruments XTP601 oxygen sensor is ideal for this application. Based on thermo-paramagnetic sensor technology it is ideally suited for determining the level of oxygen in a wide range of background gases. The sensor will operate efficiently under various environmental conditions and is insensitive to mechanical shock. It has very good response time characteristics, has no consumable parts and offers excellent accuracy, for example, 0.02% O2 over a range of 0-1%. The thermo-paramagnetic sensors used in the XTP601 will last the life of the instrument in normal operation. Features include enhancements such as an integrated touch-screen display that makes configuration and calibration easier. This reduces time spent maintaining the unit, further reducing the total cost of ownership.